[Episcopal News Service] A previously little-known piece of history just outside the doors of Calvary Episcopal Church in Memphis, Tennessee, is being brought to light as the church prepares to dedicate a historical marker at the pre-Civil War site of the Forrest Slave Mart. An existing historical marker on Calvary’s block notes that it once was the home of Nathan Bedford Forrest, a 19th-century businessman and Confederate general, but the marker fails to convey the more disturbing context: Forrest was a slave trader, and from 1854 to 1860 he operated a slave mart on property that the church now owns and uses as a parking lot. The Rev. Scott Walters, rector at Calvary, called it “chilling” to think of the inhumanity that once occurred every day on land located just beyond the church wall behind him when he stands at the pulpit every Sunday. But the effort to research the full history of that block has been infused with a spirit of reconciliation as much as an interest in revealing ugly truths. “We don’t want it to be a divisive thing but a truth that can be told that can lead to some healing,” Walters said in an interview with Episcopal News Service. The new historical marker, to be dedicated April 4 as Memphis marks 50 years since the assassination of Martin Luther King Jr. in the city, is the product of a research project led by history professor Timothy Huebner, who is a member of Calvary Episcopal Church. An organization called Lynching Sites Project Memphis, whose mission is to accurately tell the history of racial violence in and around the city, first drew attention to the existing historical marker in 2015. Organizers held a prayer service calling for the sign to be changed to make clear that Forrest’s “business enterprises” were the selling of humans. At the same time, the Episcopal Church has made racial reconciliation one of its three priorities during the current triennium. Some dioceses already had taken up their own efforts to confront hard truths about their complicity with slavery, segregation and lynchings. Notable examples include the Diocese of Atlanta and the Diocese of Tennessee, which encompasses the central third of the state but not Memphis. In 2016, Huebner and others at Calvary Episcopal Church formed a group to learn more about the church’s block and surrounding properties. Their inquiries initially focused on blighted buildings and ways the congregation could help improve the neighborhood, but Huebner’s preliminary research soon gravitated toward Forrest’s historical activities on the block. A Memphis city directory from the 1850s shows an ad for the slave mart run by Forrest and a business partner. He uncovered those surprising details in newspaper advertisements and city directories from the 1850s. 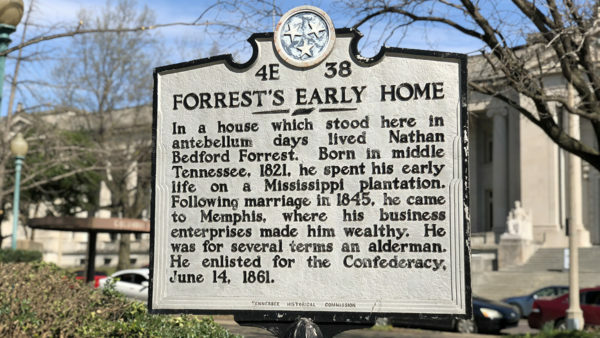 It also became obvious that the Tennessee Historical Commission would have looked through the same records and, therefore, been well aware of the Forrest slave mart when it drafted the text for its historical marker on the block, dedicated in 1955. Huebner, who teaches at Rhodes College, chose to make Forrest the subject of his historical methods course in fall 2017. His 15 students researched Forrest’s life, as well as the history of that city block, and they determined that thousands of enslaved men, women and children were sold at the slave mart Forrest operated there. The students also found that Forrest, one of at least eight slave traders in Memphis during the 1850s, was engaged in importing slaves from Africa, which had been outlawed by the U.S. in 1808. The church was built in 1843, meaning the slave trading and Christian ministry were conducted nearly side by side for several years. No evidence has been found, however, that Forrest was a member or benefactor of the church. His legacy in Memphis generated additional debate last year when a City Council vote led to the removal of a statue of Forrest from a city park in December. State legislators now are considering legislation that would punish local officials for such actions. Scrutiny of Confederate monuments intensified nationwide in August after a white supremacist rally in support of a Confederate statue in Charlottesville, Virginia, ended in deadly violence there. 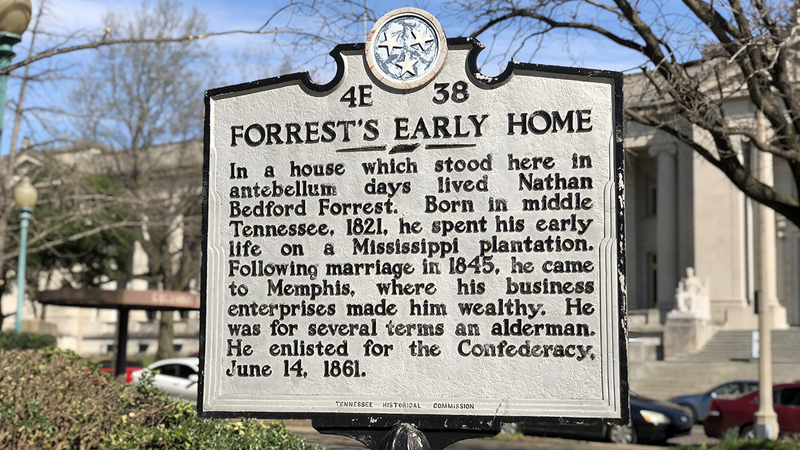 In Memphis, Huebner’s students drafted the text on the new historical marker about Forrest. A group of local scholars vetted their research. The marker itself was paid for by the National Park Service. The students also have identified dozens of the slaves who were sold at the slave mart, and some of those names will be read during the dedication ceremony. “That’s been poignant to me, realizing the names of real people and real lives and families are behind these statistics,” Walters said. The dedication is part of a full slate of events on April 4 in Memphis, where the National Civil Rights Museum is leading commemorations marking 50 years since Martin Luther King Jr. was shot and killed at the Lorraine Motel, about a mile from Calvary Episcopal Church. Calvary’s ceremony is described as a “Service of Remembrance and Reconciliation,” and it will be led by Walters and the Rev. Dorothy Wells, the rector at St. George’s Episcopal Church in nearby Germantown, Tennessee, and a 1982 graduate of Rhodes College who worshiped at Calvary when she was a student. Wells, who is black, also wonders if some of her own ancestors might have among those sold by Forrest. 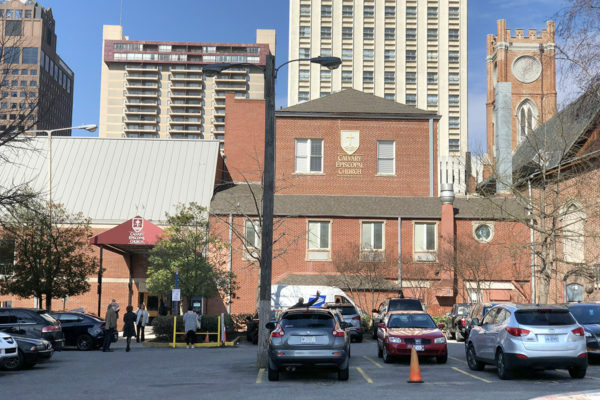 In its long and devoted ministry to downtown Memphis Calvary Church is one of the great parishes of the Episcopal Church. Proud of Calvary Church where on a visit to Memphis in 1964 I worshipped and received Holy Communion. Good memories. It disturbs me that there is even an historical marker denoting where his home stood. 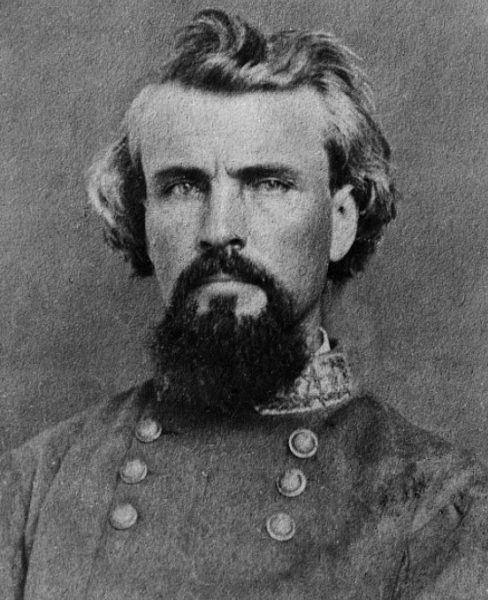 He was one of the worst generals that the Confederate army had. His actions before, during, and after the Civil War should not be displayed any where. I think it is important that we are aware not all of the United States past history was “great” or “praise worthy”. We need to know that awful, horrible things were done in past times so we don’t go back there again! If we live in the past, rather than learning from it, we bring the emotions and grudges from there to now. I agree with Catherine that we need to see US History for what it WAS: history. It may not be comfortable or PC now, but it DID happen. Living in the here and now is important, but understanding the past requires recognition of everything. A plaque or monument does not always celebrate or glorify. Rather it should always inform in order for us to receive the information for us to contemplate in the context in which it happened. I wish this article included the language for the new historical marker. Reading that it is being updated means little without knowing precisely how honest the new marker will be. 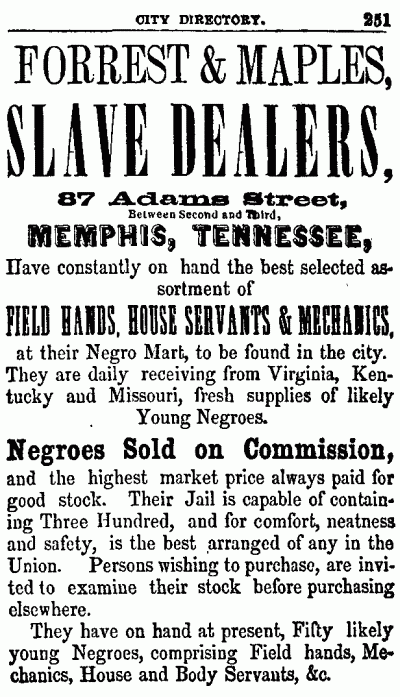 Much of the slave trade in Memphis occurred on Adams Avenue. Located in the heart of town and connecting the riverfront steamboat landing to the Memphis and Charleston Railroad line, the street offered easy access to buyers and sellers. In 1855, the city directory listed eight slave dealers, including Forrest, five of whom were located on Adams. While his business practices mostly resembled those of other traders in town, Forrest uniquely engaged in the buying and selling of Africans illegally smuggled into the United States, in violation of an 1808 congressional ban. Several sources confirm that in 1859 Forrest sold at least six newly-arrived Africans “direct from the Congo” at his yard. Slave trading proved a growth industry, and by 1860 the number of slave dealers in Memphis had increased to ten, including six with addresses on Adams. In that year, Forrest sold this property and moved one block east, where he expanded his operations, while another group of slave dealers took ownership of this lot. Secession and war disrupted the slave trading business, and in 1861 Forrest went off to fight for the Confederacy. In the decades after the Civil War, many white southerners chose to portray Forrest as a military hero, thus excusing or ignoring Forrest’s buying and selling of human beings. thank you for the text – it is a long one, indeed, but one with lots of explanation. It should be very good for educating people. Back in 1850 slave trading was hardly illegal. Now we want to re-write history in an effort to make ourselves feel better and demonstrate to blacks we are “politically correct.” What a sham. When have we gone too far in our attempt to re-write history? We made our history in the 19th century. We cannot erase it in the 21st. F William Thewalt, I have never seen a NPS historical marker that took a moral stand on past events. They only report/ record those event, such as (perhaps) stating that Forrest established a slave market on that site and later was an early leader and the first Grand Wizard of the KKK. Stating the text to be on the new sign in this article would have clarified this though. We know from all too many human stories that “legal” and “moral” are often in conflict. I don’t see how filling in gaps in the history presented to us could be considered a re-write of history. I’m grateful to historians who work to flesh out the stories of our past and to clergy and other theologians who help us process that information in a way that leads us forward as the Body of Christ. I am glad you let us know what this new marker explains. It should be displayed for all to read and contemplate. Thank you for your very informative articles. i could not be more proud and honored to be a former member since childhood of Calvary Church. It is most appropriate for this parish from which I was confirmed, married, and ordained as a deacon and now in my 48th year as a priest. As I would expect , that this fine parish to recognized this event in its history and make known this horrible event by erecting a plaque on its property. I am equally delighted to acknowledge Rhodes College, where I graduated in 1965 then known as Southwestern at Memphis played a partnership in this endeavor. Much respect to both organizations. purchased some of those humans that Forrest sold. There is little to gain and much to lose in “policing” history and adjusting the lens of our interpretation to suit the sentiment of the present. This is intellectually and academically counterproductive and troubling.